Throwing away trash can be easy and fun! This extra-wide opening, 13 gallon size Touchless Trash Can helps to create a germ free, odour free, and automated environment, using advanced infrared sensor technology to raise the lid as you approach, and close on its own as you walk away. This trash can was created to make your life healthier and easier, equipped with air escape holes for easy trash bag removal, and a retainer ring to keep the trash bag in place and out of sight. Eliminate the need to touch another sticky and dirty trash can lid, and enjoy the ease of cleaning the specially UV coated lid cover. 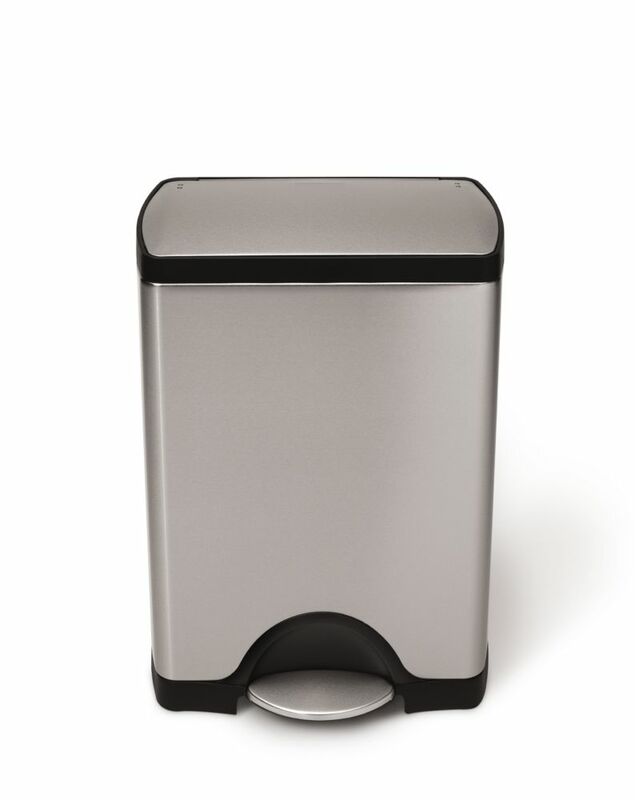 30L Fingerprint-Proof Brushed Stainless Steel Rectangular Step-On Trash Can The simplehuman Classic Rectangular Step Trash Can was designed for superior durability and a sleek look in stainless steel. Its rectangular shape makes it space efficient, while its internal hinge allows it to fit flat against your wall. This trash can also has a removable plastic bucket for added convenience. 30L Fingerprint-Proof Brushed Stainless Steel Rectangular Step-On Trash Can is rated 4.8 out of 5 by 8. Rated 5 out of 5 by Brian from I said it was excellent. I do not wish to... I said it was excellent. I do not wish to provide reasons. I suggest you change your survey and make the review summary optional. Otherwise I will not fill out your surveys in the future. Rated 4 out of 5 by Nancy from I've had this step-on trash can for several weeks now. I love it. The size is exactly right for... I've had this step-on trash can for several weeks now. I love it. The size is exactly right for my kitchen. I love the simple lines and the fact that fingerprints do not show on the metal. This new can replaces a much larger one, which was OK but it took up too much room and was always in the way. Much to my surprise, my new can holds as much trash as my old larger one. I gave it four stars for just one reason.....the metal pedal. With feet pressing on it many times a day, I knew it would soon become scratched so I covered it with black vinyl tape. You might not believe it, but it looks great and it protects the metal. This can is a keeper. Rated 5 out of 5 by Rman from Seems like a very nice quality garbage can and... Seems like a very nice quality garbage can and works well too. I’m sure I will get many years of use out of it. Rated 5 out of 5 by Nate from Great product! I took a gamble with a pricey trash can that is only used for throwing away trash.... Great product! I took a gamble with a pricey trash can that is only used for throwing away trash. Another option was a touchless can but did not see much need for it or the yearning to replace batteries for a trash can. It does not move with pressing the peddle, the can is sturdy and the basket has an opening to place extra trash bags. It can hold a few days' worth of food and waste without smelling. The trash can has a lever that will hold the lid open if needed. I highly recommend this product. Rated 5 out of 5 by JayJay from IDEAL TRASH CAN Love my trash can. I wanted something to fit in with my kitchen decor, but that didn't take up a lot of space. I really like that I can use it without using my hands; which is very helpful when I am cooking and don't want to touch anything other than food I am preparing. The price was right too! A winner. Rated 4 out of 5 by localshopper from right size for my kitchen this is an attractive trash can for my kitchen. I like to use supermarket....paper in plastic bags. This can fits them nicely, with some room to spare. Somewhat expensive however that seems to be the price for well made metal can. Rated 5 out of 5 by tillie from Fits my requirements but pricey I shopped around on line and in stores. I needed a can with a lid to fit the space in my small pantry. Stylish was not a requirement since it is seldom seen but stylish it is. It is also well made and easy to use. Ordinary tall kitchen bags fit nicely especially the ones with the gripper top.